I still use the term “bird watching” rather than “birding”. This is the term that I grew up with and it more accurately describes the way that I derive my simple pleasures. Come summer, while the listers wallow in the doldrums, you might see me sitting in the shade just watching. This is not behaviour that I would advocate to the 10,000 Birds beat community who should be sparing no effort to pad out the collaborative list, but the summer is cruel to my western palearctic constitution and I prefer to take it much more slowly. 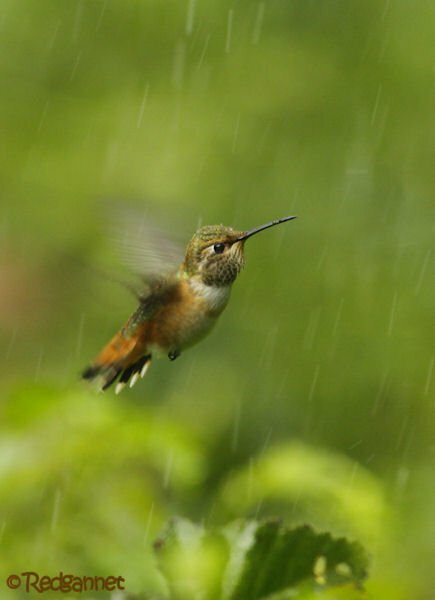 That is why I spent nearly 2 hours in the company of an Allen’s Hummingbird and an Anna’s Hummingbird, which were enjoying an invigorating dip in the spray of a sprinkler. 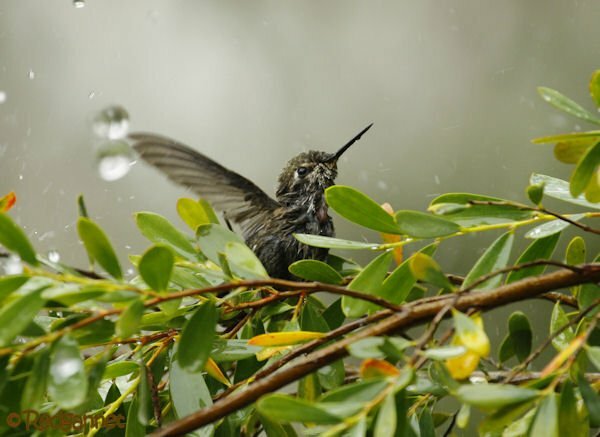 At first it was unclear if they were feeding from the ground-covering plants, but it soon became apparent that they were thoroughly enjoying the showers. 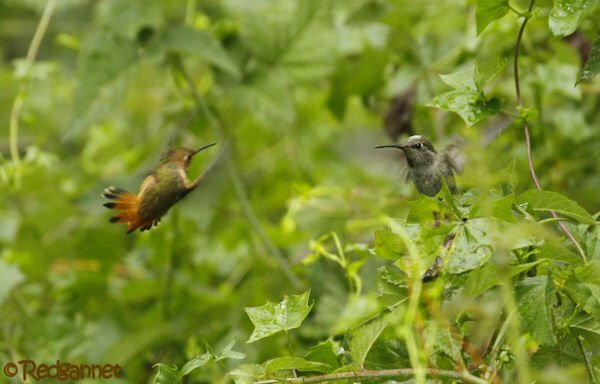 Interspecial aggression appeared forgotten and an un-hummingbird-like tolerance seemed to pervade the afternoon. 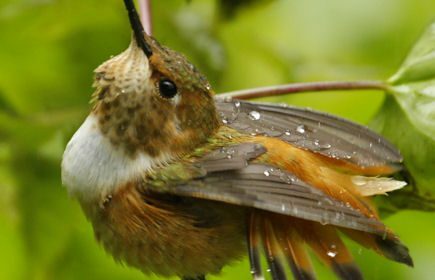 If I were fanciful, it would be possible to imagine two young birds, on whom the weight of the trials of life had yet to settle, goading each other on, daring to fly through the droplets and challenging the other to follow. 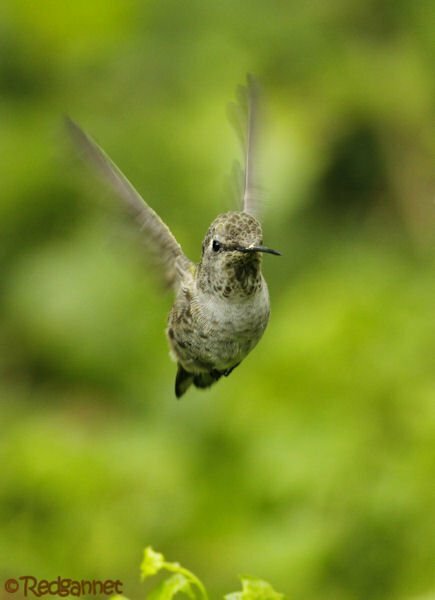 In this respect, the Anna’s Hummingbird proved to be the bolder. Even after taking a main jet shot to the side of the head which nearly blew it from it’s perch, it clung on for the next pass and the next one and the next. 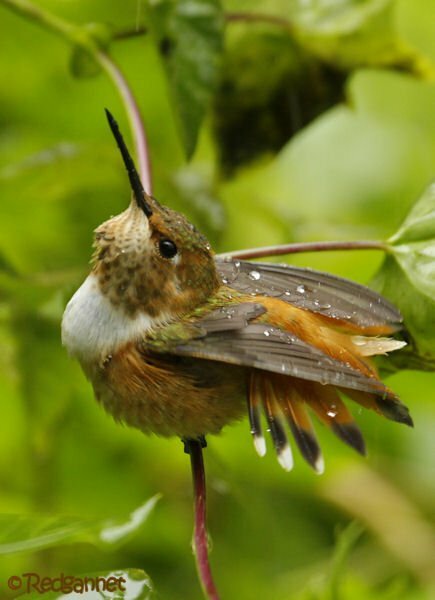 Meanwhile, the Allen’s Hummingbird found itself a low perch and luxuriated in the fine mist beneath the main jet. Pools of water collected on leaves and the bird smeared itself against them. I am hoping that someone might suggest a reason why the birds were drenching themselves over such a long time period (I watched for 2 hours) at the expense (or so it appeared) of feeding. Surely wet feathers add a lot of weight to such a small bird, making them slow in the face of a predator. It was a cool day in San Francisco, with wisps of sea mist passing through the trees. Can a tiny system afford to lose that much heat? Were they trying to rid themselves of parasites? 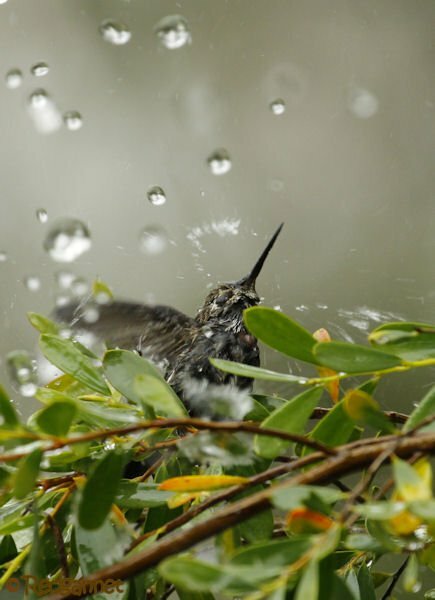 Do young birds bathe to exfoliate as their new plumage comes through? Magnificent photos, especially that top one of the Allen’s! 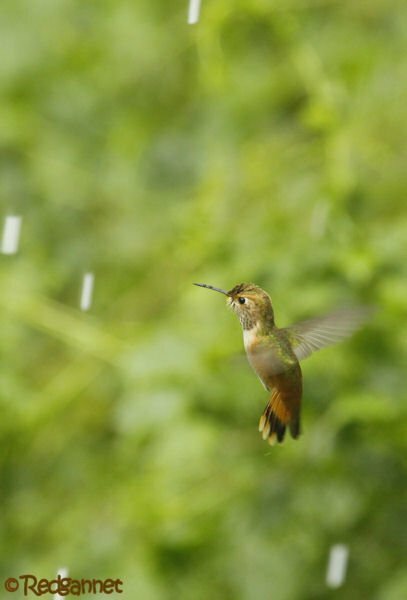 I’ve wondered the same thing when watering my garden and seeing the hummingbirds fly right into the spray.